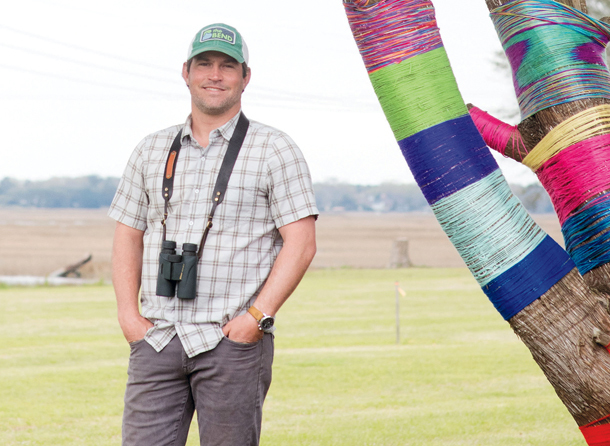 As site director of ambitious North Charleston urban redevelopment project TheBEND, Chet Morse’s daily tasks range from maintaining the property’s natural habitats to leading free birding and photography walks. In time for Earth Day this Sunday, we caught up with the former Charleston County Parks outdoor guide and naturalist—boots on the ground at the 20-acre site purchased in 2015 by Susan Pearlstine of The Pearlstine Company—to learn more about the Ashley River-front property and how the community can enjoy it now. CM: What does TheBEND look like currently and how do you see it evolving? Chet: Today the site is a beautiful, open, natural green space. The people involved are passionate about what it can be. An ideal development plan would be one that combines a well-designed commercial space with community access to the natural surroundings. We want to serve as a model for responsible growth and think this can be a project that uplifts not only this particular place, but surrounding properties as well. CM: What public activities are offered at TheBEND? CM: What nature walks or programs do you lead? Chet: All of them! As an outdoor educator by training and life-long nature nerd, one of my favorite aspects of this role is finding creative ways to engage and encourage locals to get outside and interact with the incredible natural resources the Lowcountry offers. CM: Tell us about MarshJAMs at TheBEND. Chet: For MarshJAMs, we partner with local organizations whose values and/or mission align with ours—these concerts have a great backyard-party vibe. Our next one is May 3 in conjunction with the City of North Charleston Arts Festival. CM: What’s your favorite place to play outdoors that isn’t TheBEND? Chet: Caw Caw Interpretive Center in Ravenel; there are miles of trails, a staff of expert educators, and it’s one of the best places to spot wildlife unique to the Lowcountry. To find details on TheBEND’s upcoming events—including the May 3 MarshJAM—click here. To read more from our April issue, click here.